The above graph is from an experience I had while leading a team at Uber. We added 2 new engineers from projects with different languages and styles. The first PR was good code but very inconsistent with the existing coding practices. Instead of writing up a style guide and making the engineers memorize it, we added jscs to the project and instantly fixed everything. 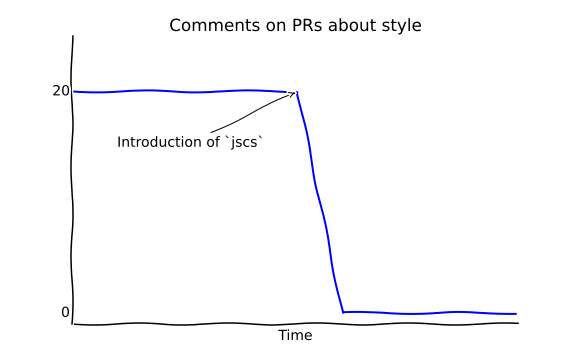 The engineer got quick feedback for style conflicts via the test suite and all future PR comments were focused on actual issues rather than style discrepencies. There are 2 categories for linting/style checking tools: validators and formatters. Validators have been around for much longer and as a result, have more features than formatters. Formatters are an emerging set of tools and as a result, have less features.